Surgical site infections (SSIs) are commonly caused by methicillin-resistant Staphylococcus aureus and are associated with significant morbidity and mortality, specifically when hardware is implanted in the patient. With a cohort of 709 patients undergoing elective orthopedic surgery with hardware implantation, Bebko and colleagues assessed the effect on 30-day SSI rates of a 2-day decontamination protocol using chlorhexidine washcloths and oral rinse and intranasal povidone-iodine solution. They report that, compared with controls, patients who underwent preoperative decontamination had significantly lower SSI rates. Colon cancer is increasing among adults younger than 50 years, but stage-specific relative survival is unknown outside of clinical trials. Kneuertz et al conducted a nationwide cohort study of 13 102 young patients (18-49 years) with colon cancer and 37 007 older patients (65-75 years) with colon cancer. After surgical resection of curative intent, young patients received more intensive adjuvant chemotherapy at all stages for only marginal survival gain, suggesting that they will likely face unique survivorship needs in the long term. Robotic-assisted pancreatic surgery is safe and feasible; however, the number of procedures required to optimize outcomes has yet to be defined. Boone and colleagues performed a quality analysis of 200 consecutive patients who underwent robotic pancreaticoduodenectomy to identify improvements in performance metrics. They conclude that the learning curve of robotic pancreaticoduodenectomy is approximately 80 procedures, but the number may be less with the presence of better guidance and mentorship for future surgeons who are adopting the procedure. Recurrence after laparoscopic paraesophageal hernia repair may be high, but most patients maintain an excellent quality of life (QOL). 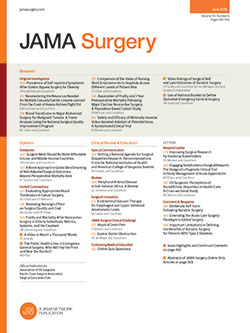 Lidor et al performed a prospective study of 111 patients who underwent elective laparoscopic repair of type III paraesophageal hernia with biological mesh buttressed over a primary cruroplasty to evaluate long-term (>3.5 years) QOL and to identify potential risk factors for recurrence. Despite a high recurrence rate (27%), overall, patients experience excellent long-term symptom resolution (preoperative vs 2-, 12-, and 36-month QOL scores), and the largest preoperative hernias were more likely to recur after repair.